Routes for the initial rollout of the Beeline system were determined from analyzing historical travel patterns and suggestions obtained through the Beeline website. Two government agencies, the Infocomm Development Authority (IDA) and the Land Transport Authority (LTA), came together and launched the Beeline mobile app experiment earlier this year. The Beeline mobile app allows commuters to book advance spots on express bus rides for 21 routes across Singapore. The purpose of the experiment is to discover how transportation systems can adapt to the commuter demand. This may pacify some frustration among commuters, concerning the traffic congestion on Singapore roads during peak travel hours. The initial Beeline experimental bus routes started earlier this year. The routes that were available at the launch included: Marine Parade, Punggol, and Tampines to CBD, and back the other way. It added several routes in the following months after its release. Bus-Plus operates the buses as they are one of the key partners of the Beeline app. Riders are able to book single or multi-day tickets, priced at $4 to $6 per trip. This ensures the rider will have a comfortable seat on their way to work. The Beeline ride consists of no more than five pick up stops per journey. 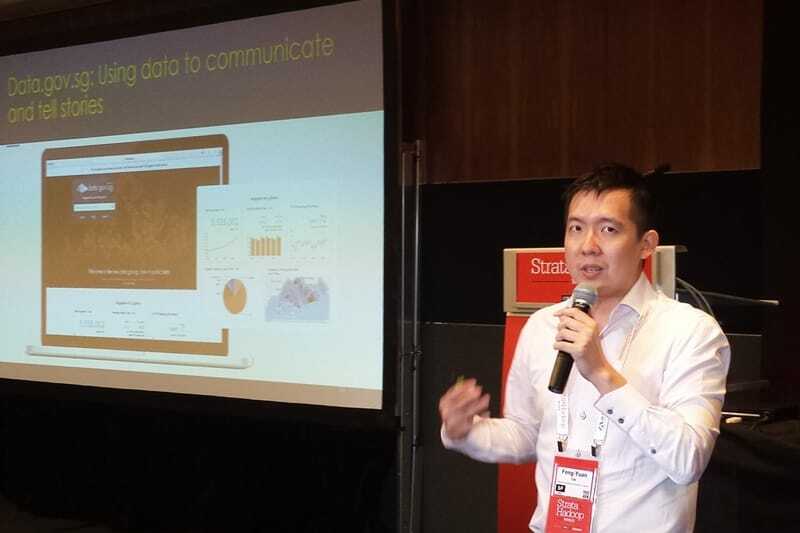 Yesterday, Mr. Liu Feng-Yuan, Director, Government Analytics, Infocomm Development Authority, spoke at the Strata + Hadoop conference about how his team was able to capitalise on the power of data analytics to drive this private bus service. It seems that in a city-state like Singapore, public transportation is the best option for getting around due to the flexibility, cost savings, and accessibility. However, commuters are starting to explore other options due to their dissatisfaction with their current mode of transport. “When you look at mass transit, it is always going to be more sustainable. However, it is not always going to be able to customize to the commuters’ needs,” stated Mr. Feng-Yuan. The development team behind the Beeline app drew insights from EZ-link data, to confirm possible routes for this private bus service. They studied and observed where commuters would begin and end their journeys, and created a heat map visualisation of thee data. The development team also looked at data on the movement of taxis throughout Singapore. Mr. Feng-Yuan emphasised that from this data, the team was able to better assess viable beeline routes for commuters. This data analysation process helped identify which requested routes would be most successful when deployed through Beeline. Pre-booking is one of the most important features to the Beeline experiment. This is so that the rider can guarantee their spot on the Beeline bus, without the hassle of waiting for the bus to appear at a certain time and there being no room left. This is a problem faced by those who ride large charter buses trying to deliver masses of people throughout popular routes. If a certain route is not available, commuters can request for it on Beeline. In selecting candidate routes, the Beeline team must determine its rate of demand from the public and feasible success. “We have had 20,000 suggestions over the last 3 months, and tens of thousands of downloads for the application,” said Mr. Feng-Yuan. Since launching the experiment, the Beeline team has made some adjustments to routes based on the capacity and need. Beeline is expected to run until the first quarter of 2016. The agencies and their partners will then decide if the concept has the capabilities to expand. This will be dependent on commuter response and usage rates. To learn more about the Beeline experiment, commuters can go to www.beeline.sg or download the app.